Ever wondered what life would be like if you had superpowers? Meet the Zeroes. And finally there's Scam, a boy who has an inner voice that can get him exactly what he wants. These powers sound awesome right? But as a wise old man once said 'with great power comes great responsibility'. After Scam's voice lands him in serious trouble - again - it's up to the rest of the Zeroes to bail him out...that's if they can get over what happened the last time his 'voice' screwed them all over. This time the stakes are higher, drug lords, mobsters and even the police are hot on their heels, and then there's the appearance of another 'superhuman' with powers just like theirs. 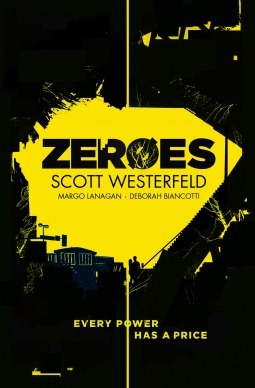 Among the glut of Marvel and DC films we're getting and the rise in popularity of the 'superhero' movie and TV genre, Zeroes comes as a breath of fresh air. Less of an 'Avengers-esque' type of storyline, the novel is more of in the vein of darker superhero premises such as the TV show Heroes and the first few X Men movies. In the spirit of those shows the novel follows a group of misfits, with the running them that superpowers come with a price. Their world isn't dystopian, these guys are 'chosen ones', though obviously there's an element of suspending belief that these teenagers can face mobs and drug lords, the scenarios feel very 'real' in a wrong place at the wrong time kind of way. With such a big cast it's often so rare to see all of them explored in equal measure, but there's so much character development from each person throughout the novel, making the ending all the more satisfying. Not to mention that cast themselves are brilliantly diverse too. One thing I picked up on that was really Interesting was how their ‘superpowers’ were at one point compared to dealing with a mental illness. Scam’s in particular is likened to schizophrenia, and it's arguably Chizaria’s makes her experience severe panic attacks. Both of these instances only go to reinforce the idea that powers come with a price. In terms of narrative style, I didn't even register with me that the book was co-authored until about a third of the way into the novel. Westerfeld, Lanagan and Biancotti's voices flow seamlessly and the story works so well as a cohesive novel written by one person. Overall, Zeroes gets a big thumbs up from me. The plot felt fresh and was hell of a lot of fun too. The great thing is that you really root for the gang and you want them to be heroes rather than zeroes by the end of the book. For lovers of…X Men (the comics & the movies), Fantastic Four, and Heroes (TV series).